When looking for a restaurant to try, I rarely think to myself “Hmmm…I wonder how the food is at the local bowling alley.” However, since the weather wasn’t great and we were meeting up with a couple friends, the idea to grab some food and maybe bowl a string/frame or two provided a good indoor activity to keep us occupied on a Saturday night. A quick review of the menu added a bit of intrigue to the idea, and so we planned an outing to Easy Day on Broadway in South Portland, a bowling alley/food and drink purveyor which I had yet to try even though it had been around for a of couple years. Easy Day boasts five bowling lanes, some big screen TV’s, a square-ish bar, and a restaurant in a lively but laid back atmosphere. An initial look gave me the feeling that it was definitely a fun place to be as a party was taking place in one corner of the room and patrons were scattered throughout the rest of it – some bowling, some at the bar, and others eating at tables. Everyone seemed to be having fun and we were immediately approached by staff, both upon entering and then again when we were seated. Considering that I’m not used to bowling alleys being known for their service, it was a good start. After a bit of gawking at menus, a waitress came by to take our drink orders. My wife ordered a Kendall Jackson Chardonnay and I passed. It was water and driving for me that night. As our friends provided their drink orders, I started trying to figure out what I wanted to eat. A little more than just the burgers and onion rings I expected from a bowling alley, their menu was a combination of pub grub and pizza parlor favorites – all with an Easy Day spin to them. It was an extensive menu and one that had me working hard to figure out what I would like best. As I looked down the list of available items, sandwiches, salads, and pizza all caught my attention, but I kept refocusing on the starters/pub food. I couldn’t help but notice lots of meaty options and when I saw there were multiple varieties of both tater tots and nachos, I figured those were put on the menu with me in mind. As I sorted through them, I saw the Irish Nachos Tater Tots – bacon, corned beef, red peppers, jalapenos, tomatoes, melted cheese, Russian dressing. 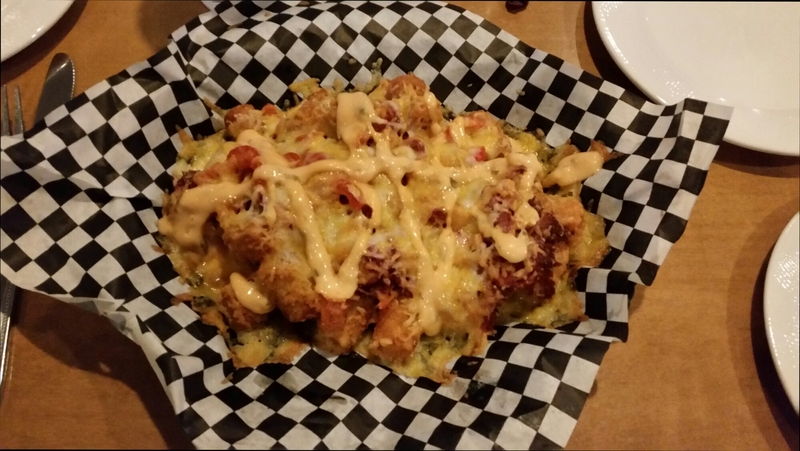 As a fan of both tots and nachos, the combination of the two with double meats sounded like an explosion of awesome. 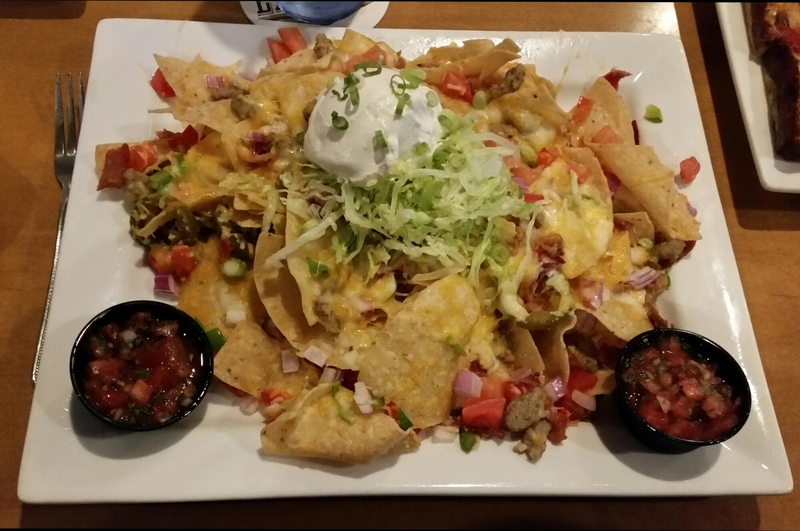 I settled on those, and because one can never have enough nachos, also decided on the Easy Day Nachos – Italian sausage, bacon, bell peppers, red onions, tomatoes, pepperoncini, cheddar sauce, and shredded iceberg lettuce on crispy tortilla chips. Never having had sausage or bacon on my chips that I could recall, I thought those would be excellent too. I had picked my double nacho/quadruple meat mountains to order and my wife wanted to get a Large Detroit Style Deep Dish Mushroom Pizza. The elves at Easy Day wake up early every morning to make the sauce and dough from scratch according to the menu. The team also met with a world champion pizza maker before opening the place so they could learn the best pizza making techniques on earth. Mrs. Portlandeater hoped I would eat some of the pizza and I promised that if there was any room left after I ate the my food that I would happily oblige her. A salad and another pizza rounded out the orders at our table. We watched a bit of NESN on the TV next to us to pass the time and soon the tots came out. A medium-sized pile of the potato plugs plopped in front of me. The tots were covered in both melty and crispy cheese, the veggies, and a zigzag of dressing. I tried my first bite, stabbing a tater and grabbing as many of the toppings as I could on the fork. Unfortunately, the stabbing resulted in the potato breaking in half even though it was quite crisp. I tried again, this time scooping all the food with my fork and successfully getting a nice mouthful with almost all the toppings. It was great. The tots gave a nice crunchy base of both texture and seasoning. Cheese is always perfect with potatoes, and the Russian added a nice creamy zing. The veggies were a nice addition, but I most liked the jalapenos which threw in just a bit of fire. The tots became a dish to share and soon they were gone. After a little wait, the rest of our food came out. I was happy to have a plate of nachos in from of me and dug right into them. With two little cups of salsa on each side and sour cream on top, I had plenty of accompaniments in which to dip my chips. I noted a hearty helping of cheese and lots of meaty bits. I worked a chip into my hands like the crane claw at the arcade. Then I dipped the crunchy guy in a little dairy sauce and chomped on it. The cheese and sausage on this particular corn crisp were a match made in heaven as the meat produced a quality taste and acute happiness. The bacon on my other bites sent me on a trip to the smoke shop, giving the nachos an otherworldly hue of maniacal meat. With lots of nachos down the hatch and many more remaining, I decided to go for a slice of the mushroom pizza. The pie had three lines of red sauce on top of it as opposed to the standard of sauce smear on the bottom. I grabbed a piece with plenty of the tomato topper and went to work. 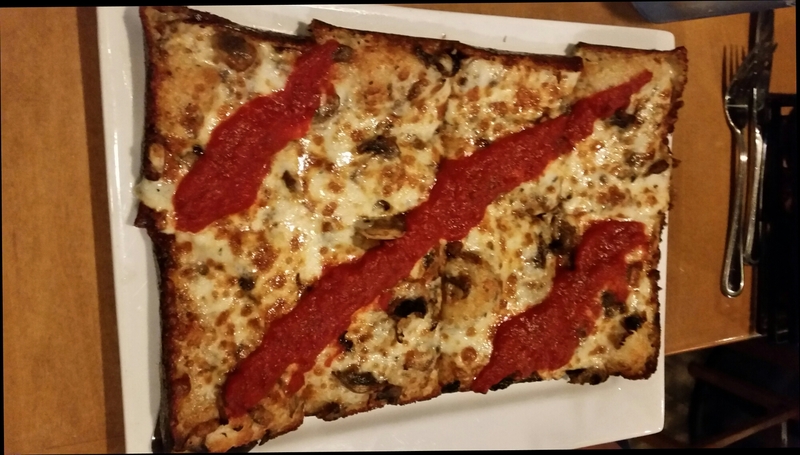 The crust was very bread-y – think Sicilian with about half the thickness. There was a sufficient serving of mushrooms built in and plenty of cheese. A bite warmed my heart as I was most struck by the sauce. Beautifully flavored and fresh, the sauce had smooth consistency without being runny or chunky. It added a solid flavor to the dough, but wasn’t exceptionally sweet. The Detroit style deep dish was a winner. My piece of pizza went down easy and I went forward with finishing the nachos. After all the eating, the rest of the table ordered more drinks and we decided to pass on the bowling. It looked like the alleys were busy and we didn’t have the energy left to hurl 16 lbs. balls at pins congregated at the end of a waxed, wooden lane. Instead, we continued to linger longer than we expected, talking about the real meaning of the most common emojis and ordering multiple rounds of drinks with the waitress regularly coming by to check on us. Eventually, after everyone felt thoroughly watered, we called it an easy day and began to pack up. Our final total on the food and drink after tax and tip was just under $75 for my wife and I. I’m not sure how many libations my wife consumed, but it seemed a very fair price. We were both very full and even took some pizza home. Sure, Easy Day is a bowling alley, but the restaurant holds it own among Portland area eateries with it’s bar menu type fare. They offer a wide variety of simple, inexpensive food that they take to the next level with a little culinary ingenuity and a smattering of carefree fun. While the menu does seem to be meat-heavy, there are plenty of non-meat options if that’s more your style. Also, the service was notably good from start to finish as we never felt forgotten or ignored even though we were there for a while. I’ll be back for certain, and next time I’ll attach some strings to my tots and tortillas. This entry was posted in Portland, ME food on June 15, 2016 by peterpeterportlandeater.